Gas water heaters are a lot like decks, in the sense that most handymen feel qualified to install one. 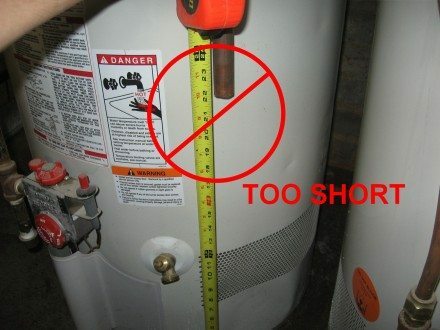 Thanks to these handymen, I find more installation defects on these two items than just about any other component in the home, and today I’m going to share my list of the most common gas water heater installation defects. If the water heater were to malfunction and the burner just kept heating the tank, the tank would eventually rupture, turning the water heater in to a missile. Mythbusters did a great re-creation of this, which you can see below. While Adam and Jamie do these experiments in style, the Watts company was doing these same experiments back in 1939. Must be full sized. This almost always means it must be a 3/4″ pipe. Must terminate within 18″ of the floor (6″ for the rest of the country – we’re special here in Minnesota). Must not be threaded or capped at the end. If it were threaded at the end and the valve started leaking, some dope might screw a cap on the end, thus disabling it. In some jurisdictions, such as Minneapolis, only metal is allowed. Those plastic discharge tubes that you can buy at the store aren’t allowed, even though they’re listed and labeled for the application. Why? Because that’s what it says in the code. I can’t elaborate further on this one. The installation requirements for the gas piping that leads to water heaters is the same as that for just about any other gas appliance, but again, I find more problems at water heaters than at any other gas appliance. 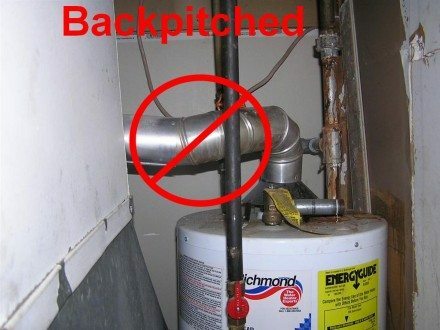 There must be an approved gas valve installed within three feet of the water heater. There must be a way to disconnect the gas piping to the water heater after the valve. This could be through the use of an appliance connector or a union. The idea here is that you need to be able to shut off the gas to the appliance and be able to disconnect the appliance without shutting off gas to the entire house. There must be a sediment trap installed just before the water heater. A sediment trap is required to help prevent little impurities in the gas piping from fouling up the appliance. The water pipes must be at least 3/4″. 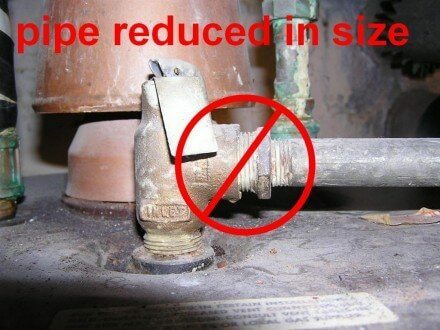 There must be a shutoff valve installed on the cold water supply pipe that feeds the water heater. A common myth among home inspectors is that there should never be a valve on the hot water side… but this is perfectly acceptable. Flexible water supply connectors can’t be used in Minnesota, because they reduce the water pipe diameter. From a functionality standpoint, I’ve never noticed any difference in performance with these things, but again, this is what the plumbing code says. 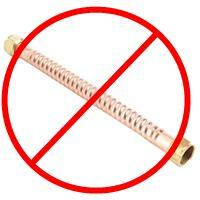 UPDATE: As of 1/23/16, flex connectors are allowed on water heaters in Minnesota. The vent connector must have three screws at every joint. For a single-wall vent connector, six inches of clearance must be maintained to any combustible surface, such as wood or drywall. For a double-wall vent (B-vent), the clearance can usually be reduced down to one inch. 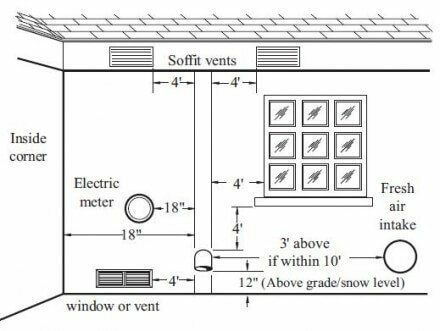 The vent must pitch upwards with a minimum slope of 1/4″ per foot. This is a minimum requirement – just following this requirement does not mean the water heater will draft properly, but it’s a start. 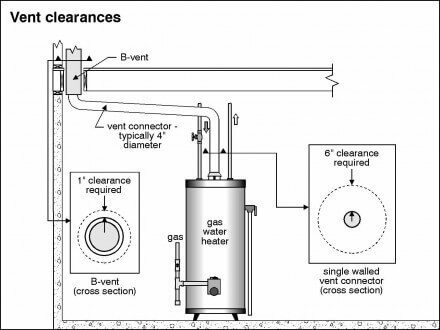 For a powervent water heater, the manufacturer’s installation instructions must be followed: they all seem to use the requirements in the diagram below for the vent terminal location. The one that is done incorrectly most often is the distance to the fresh air intake. That wraps up my list of the most common installation defects. This is by no means an all-inclusive list of the requirements for a water heater installation, but it probably covers 95% of the installation defects that I find during home inspections in the Twin Cities. For Minneapolis Truth In Housing evaluations, any installation that is three years old or less must be completely up to code; failure to follow any of these requirements would require repair. It’s me again, Reuben – sorry but I forgot to tell you that I have an electric hot water heater.